How Will the Rising Cost of Prescription Drugs Affect Medicare? Home | Blog | How Will the Rising Cost of Prescription Drugs Affect Medicare? In an attempt to address the rising cost of healthcare in the United States, the Trump administration recently unveiled a plan to reduce the cost of prescription drugs. 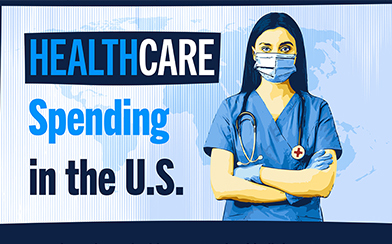 This issue is important not only for the quality and affordability of healthcare for all Americans, but also because it has significant implications for our nation’s fiscal future. One of the largest contributors to rising healthcare costs, spending on prescription drugs has been growing exponentially over the past few decades. 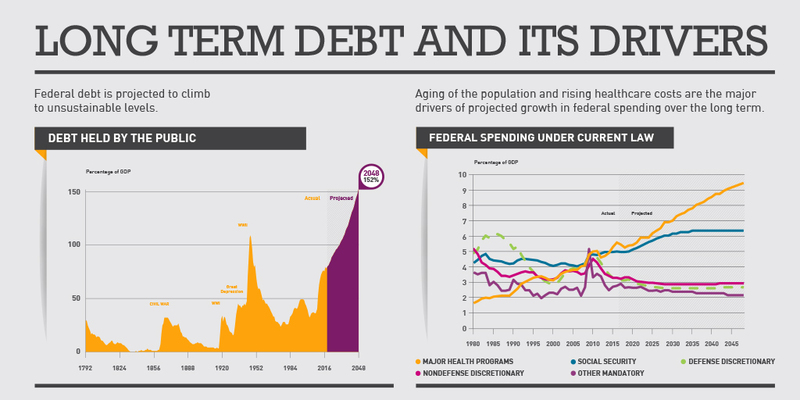 In 1980, such spending totaled around $12 billion and accounted for about 5 percent of total healthcare costs. By 2016, prescription drugs accounted for 10 percent of healthcare costs, or about $330 billion, and that amount is projected to nearly double within the next decade. In real (inflation adjusted) terms, prescription drug expenditures have increased by almost $300 billion from 1980 to 2016. 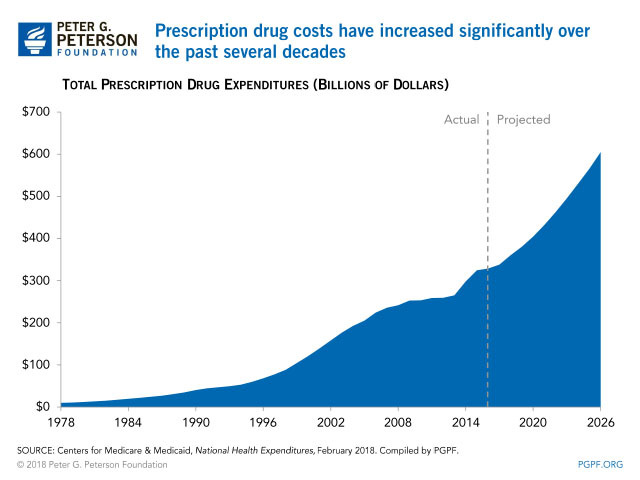 Why Are Prescription Drug Costs Increasing So Rapidly? 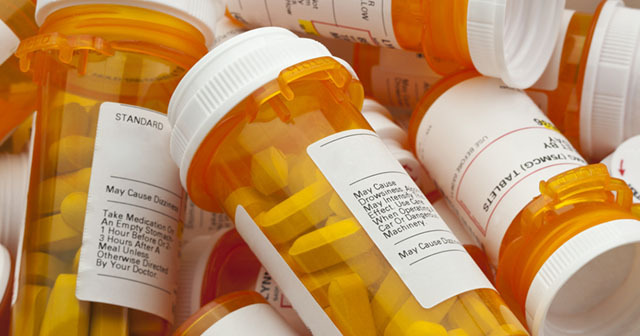 The rise in prescription drugs costs can be attributed to many factors. 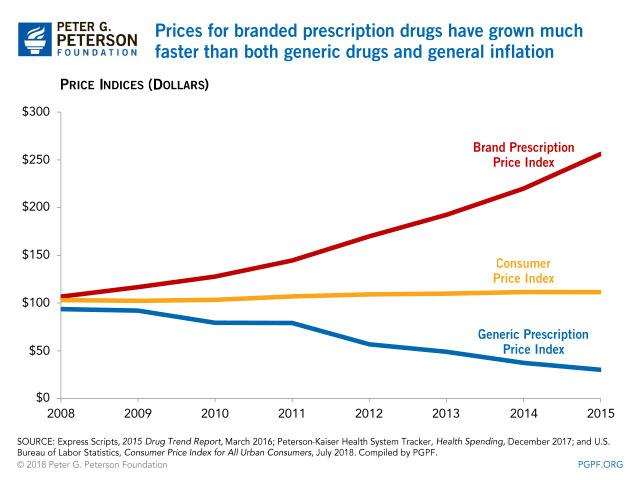 Prices for prescription drugs, arguably the largest driver of costs, have been increasing substantially over time. For example, a recent report by the Senate Homeland Security and Governmental Affairs Committee found that, on average, prices for the 20 brand-name drugs that are prescribed most often for seniors have increased by 12 percent every year for the last five years. Inflation over that period averaged only 1.5 percent annually. In 2006, “Part D” was added to Medicare to provide prescription drug coverage to beneficiaries; thus, the rising costs of prescription drugs has had a substantial impact on the program. 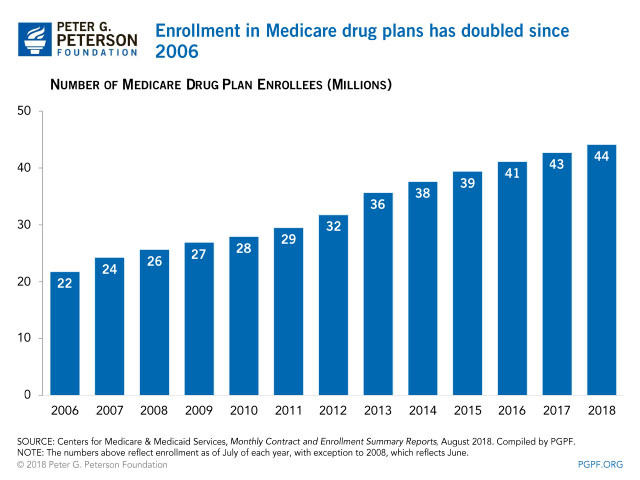 Primarily due to a growing and aging population, Medicare Part D has grown from 22 million enrollees in 2006 to about 44 million enrollees in 2018. That figure is expected to continue climbing as more baby boomers approach retirement age and becoming eligible for Medicare. The Congressional Budget Office projects that Medicare Part D enrollment will reach 61 million by 2028, almost a 40 percent increase from 2018. 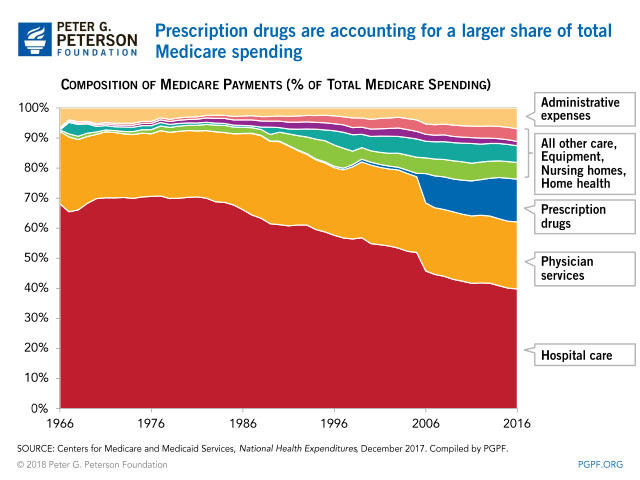 Due to rising prices and the increasing number of people participating in Medicare drug plans, prescription drugs are accounting for a larger share of Medicare spending. In 2006, prescription drugs represented about 10 percent of Medicare spending. That figure increased to 14 percent, or $95 billion, in 2016. The rising costs of prescription drugs and their effect on Medicare could have serious consequences on our healthcare system and our nation’s long-term fiscal well-being. Containing those costs would be one step towards America’s long-term financial sustainability. Related: Why Are Americans Paying More For Healthcare?